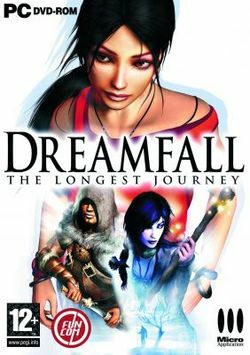 Dreamfall: The Longest Journey was developed by Funcom and released for the Windows and Xbox. It is the sequel to the 1999 PC game The Longest Journey. It is 2219. You play Zoë Castillo, a student who has left college to try and find herself. However, it hasn't been easy for her as she finds that she is wasting a lot of time doing... absolutely nothing. Although the so-called Static seems to be growing worse across the Wire, disrupting communications and causing the occasional blackout of information, there is little else in her life that has brought her out from her personal malaise. That is, until things start to happen around her that she cannot easily explain. When a close friend disappears and when she begins the search for the answers that he held, she will become involved in more than a simple investigation. As Zoë encounters new friends and foes in her struggle to understand the worlds that she will journey to, the story will also be seen from their perspectives as they try to uncover the truth behind the dark force threatening to destroy all that they know. This page was last edited on 16 August 2016, at 14:48.